We did it! Anna’s first trip to Disneyland was a great time. We wore each other out (see the last picture), but we have memories that will last a lifetime. 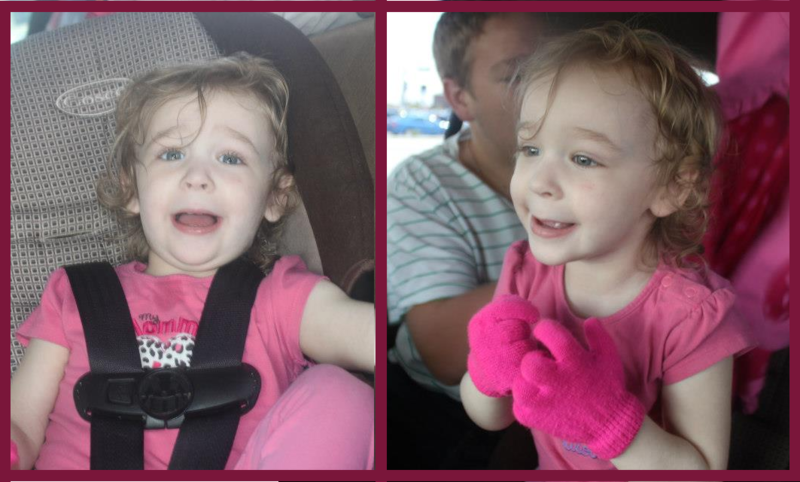 Thanks to the help of her aunt Sophie and uncle Bridger, we successfully made the long drive to Anaheim and back with Anna, who hates being in her car seat. She was so happy every time she could get out! Anna didn’t quite know what to expect about the whole thing, but as we walked up to the front gates of Disneyland, she noticed the giant pumpkin versions of her beloved Minnie, Mickey, Donald, Goofy, and Pluto and she was excited. The first day at the park was for Mickey’s Halloween Party, a ticketed event that offers special fireworks, a new parade, fun music and atmosphere, and trick-or-treating stations all over the park. We created t-shirts for the event, and Sophie and Bridger made matching hats! 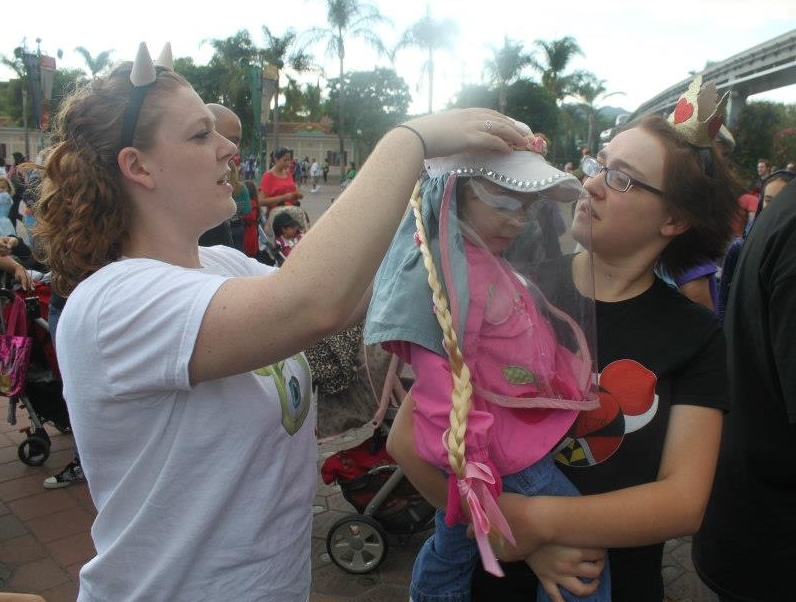 Anna got a long braid to compliment her Rapunzel shirt. This event was perfect, because the sun went down just a few hours after we arrived. We first stopped by City Hall to pick up our Guest Assistance Card, which we hoped would allow us to avoid waiting in lines out in the sun. It did help some of the time, but only when the alternate entrance was out of the sun or very, very short. Our first ride was Peter Pan, a family favorite. As we approached the line, there was no cast member to ask where we should go and what to do. The the normal line was an hour wait, and Anna would need to wear her hood, gloves, and gear the whole time. The only other option was to get in the line for wheelchair access. Unfortunately, that wait was just as long as the normal line, and had even more sun exposure. We kept Anna in the shade as much as we could. The G.A.C. did help us with some rides like Dumbo and Mater’s Junkyard Jamboree, but for others like Alice in Wonderland, it wasn’t much help. We were grateful to have it, but we wished Disneyland could have done more for the times when the alternate entrance line was still out in the sun. We stayed for two more days at Disneyland and Disney California Adventure, and each day when the sun went down we were so happy to not have to worry about Anna’s safety and comfort. It got very hot at times! Anna’s favorite ride was Dumbo, by far. She still remembers it when we talk about Disneyland. 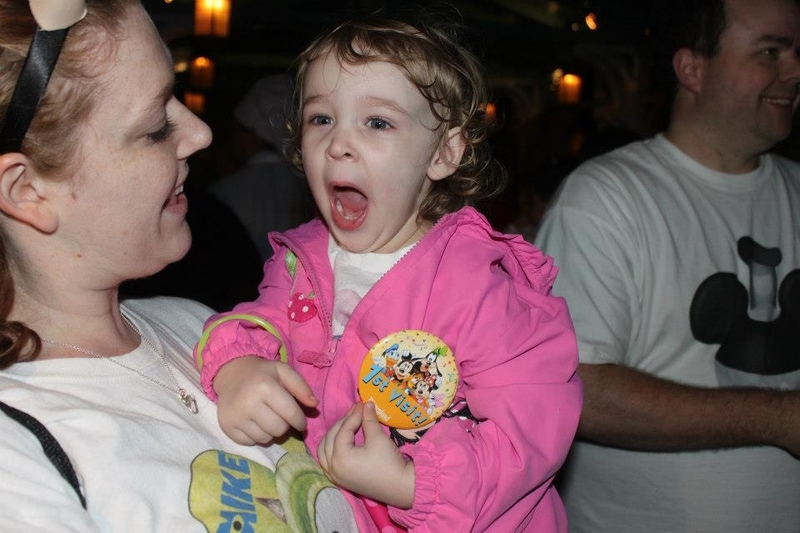 She also loved seeing Mickey in Fantasmic and anytime we passed him by. 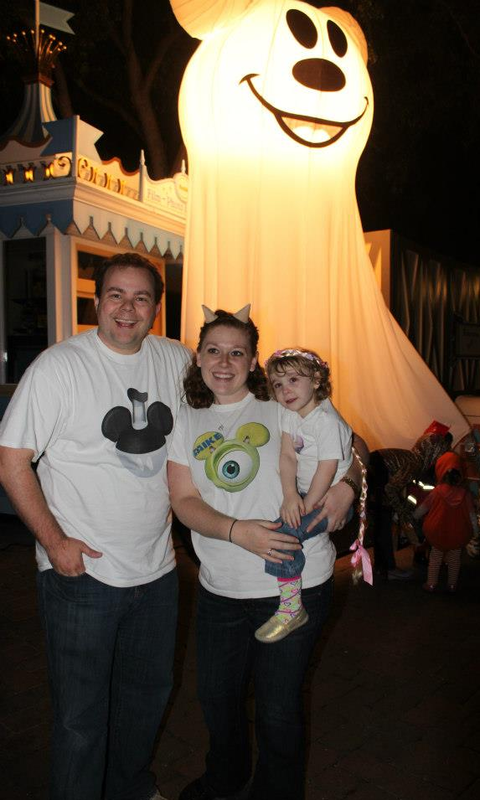 She loved dancing with the Disney characters, trick-or-treating, and the parades. 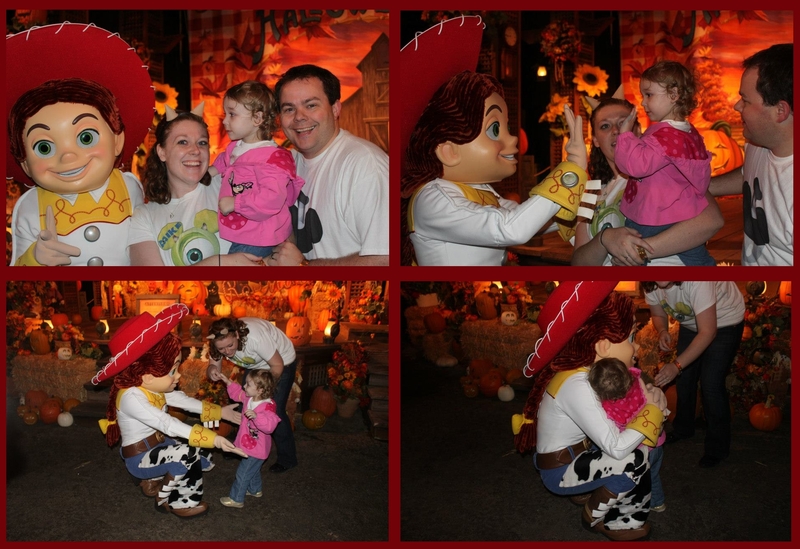 Jesse from Toy Story was happy to meet Anna…and to our amazement Anna ran right up to her and gave her a hug and a high-five! It was a magical trip, as always. It took a day or two to recover – but we had a blast! UPDATE: The full documentary is streaming free on PBS.com. Click here to watch! Debuting on Thursday, October 18 is a new documentary titled “Sun Kissed” that tells the story of one family’s experience with Xeroderma Pigmentosum. I can’t wait to watch it! You can check your local listings here to see when it airs on your local PBS station. The children with XP in this movie have a type of XP that’s a different than what Anna has. Anna’s is XP-D, and does not cause neurological degeneration. But Anna and the kids in the movie both have a 10,000 times higher chance of skin cancer due to their Xeroderma Pigmentosum, and both need to avoid all unfiltered sunlight. I look forward to learning more about XP and learning about the plight of the Navajo tribe. I hope you will watch it, too. And share it with your friends! Don’t get me wrong, I’m happy to explain XP to interested people. I really want people to be aware of it – it’s the whole purpose of this blog. 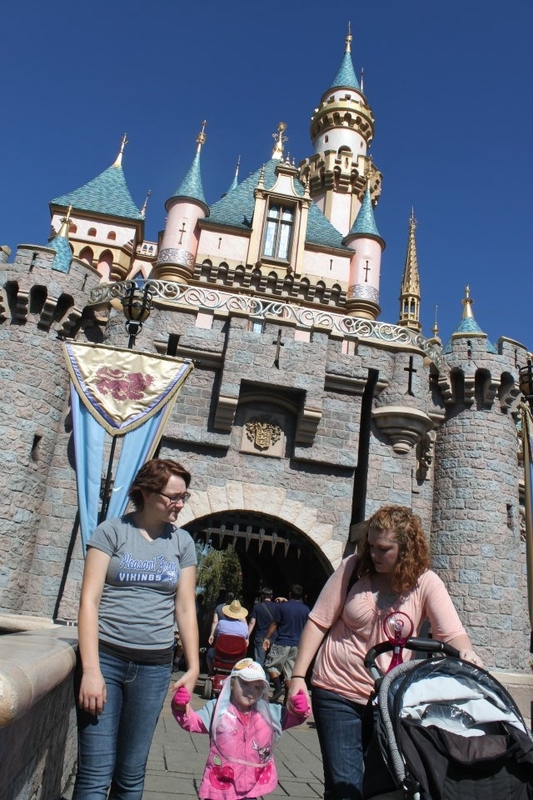 But sometimes, instead of answering all of the details, maybe I’d rather be just enjoying the time with Anna and her mom in Disneyland. I almost look forward to people asking about Anna. I can give them this card, tell them they can learn all about it on this blog, and thank them for their concern and interest. Let’s see how many I come back with! Support XP and Win a MacBook, iPad, XBox, or more! The XP Family Support group is holding a Technology Raffle! For only a $5.00 donation per ticket (or $20.00 for 5 tickets) you’ll be entered to win a MacBook pro, and iPad, an Xbox, an iPod touch or a Kindle Fire! The drawing will be held November 10th, 2012. You don’t need to be present to win. If you’d like to purchase tickets, contact me at tennor@gmail.com and I’ll hook you up. Next week can’t get here fast enough. We’re taking our first “Family” vacation to Disneyland! Of course, Libby and I have been there several times together, before and after we were married. In fact, I proposed to her in Disneyland! You could say I have a bit of a Disneyland obsession (and you’d be right). And to be fair – Anna has been once before. In the picture above, Libby carried around Anna. It was much easier to protect her back then! Making plans for a trip this time is a little bit different. Not only do we have to think about all of the little things that any toddler would need, but we also need to consider how to keep her safe outdoors in the hot California sun. At first, it seemed an impossible task. All day outside just isn’t something we attempt. It’s hard on us, it’s hot for Anna dressed up in her full gear, and generally not worth it. Disney is also providing us with a Guest Assistance Card, which will allow us to bypass long lines when they are located out in the sun. 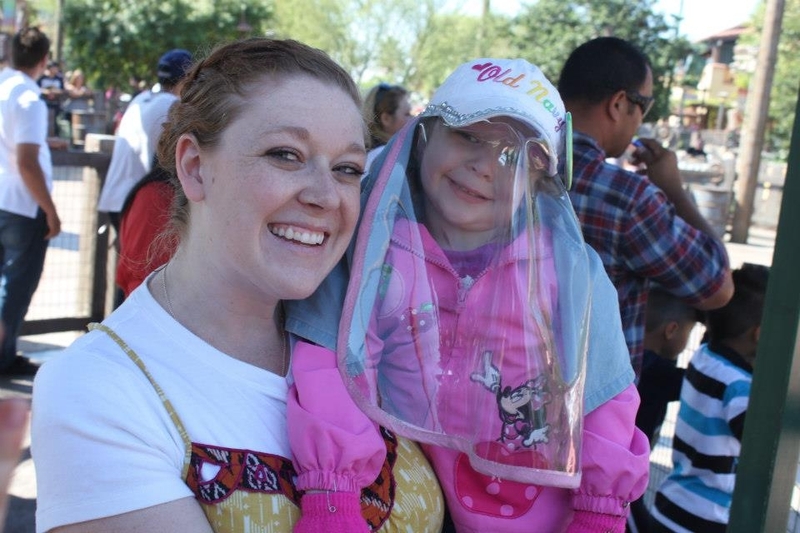 We’d love to hear your tips and suggestions for spending a day at Disneyland with a kid like Anna. 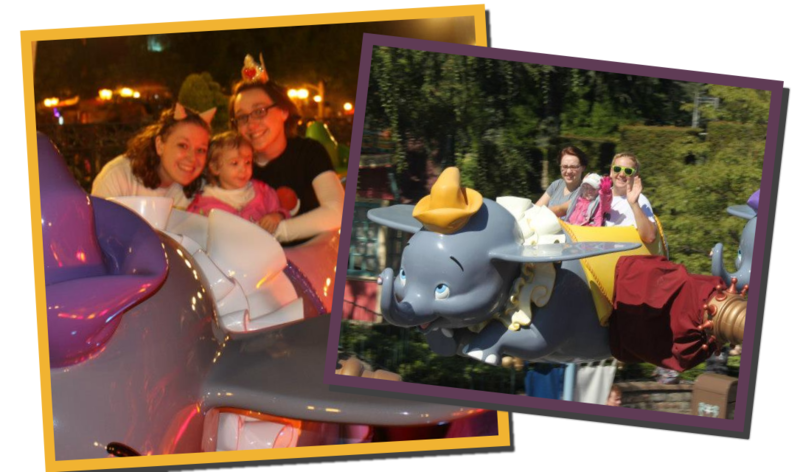 Plus – what is YOUR Favorite ride at Disneyland?